They’re both suspiciously smiley. For robots, I mean. 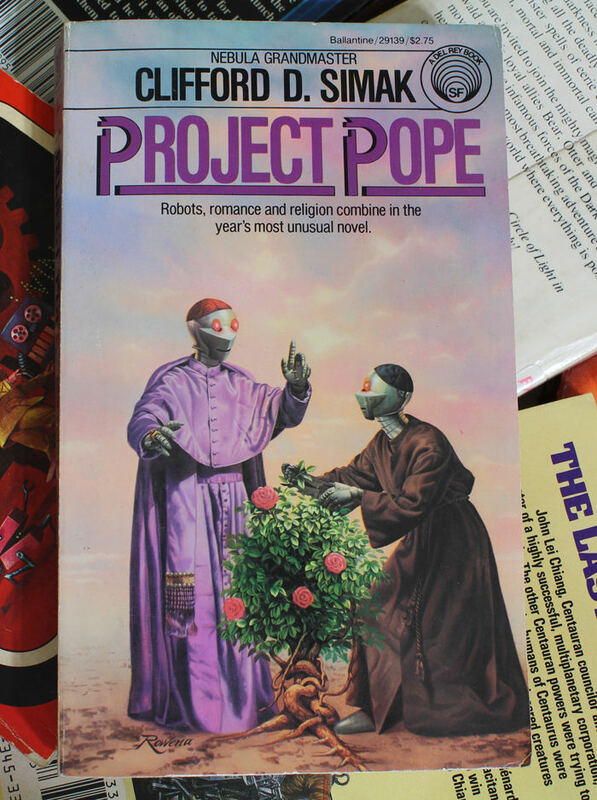 To be fair, if this is a book about robot priests it’s probably a representative cover. It’s not a book about robot priests, is it? Interesting that you can have robot catholic priests, but not women catholic priests. Someone should tell the robot on the right that hi rose bush will grow better if he puts the root system IN the ground rather than ON it. Someone shoud reinstall the graphic designer’s fonts: his capital Ps ae decidedly broken. Don’t be fooled Phil! The preview button doesn’t actually work.. I don’t think anyone has noticed yet! I wonder if the robots all have robot theologian names. “Robots, romance and religion combine in the year’s most unusual novel”. Representative, then. Also I do not find this claim hard to believe. What Vatican II looks like in the mind of Mel Gibson. Metal Luther sounds like an awesome band. You can bet these Godbothering robots have C3-PO voices. Imagine a whole sermon of that. Donâ€™t be fooled Phil! The preview button doesnâ€™t actually work.. I donâ€™t think anyone has noticed yet! I noticed a while ago. Just didn’t get around to complaining about it. HEY ADMINS! THE PREVIEW BUTTON DOESN’T WORK! Me-The robot on the right is a monk, not a priest. Cover Artist- Well, I didn’t come here to go through the Spanish Inquisition! Spanish Priests- No one expects the Spanish Inquisition! And someone fix that dang preview button! Of course the robots are smiling. They’re in a Simak novel. The only way they could have a nicer time would be to find themselves in a White novel. David> OK OK WE’LL LOOK AT THE PREVIEW BUTTON! Or possibly install something better. “Most unusual novel.” I’m not entirely sure, even in this context, that this is meant to be a selling point. Also, could we have some form of rudimentary background, or did your budget only extend as far as two figures, a rose plant… no money for actual faces, just throw some robot looking things in there. I haven’t read the book so I can’t speak for its quality, but I’d be surprised if it managed to pull off such an odd combination as robots, romance, and religion well. What does that even mean? Is it about robots who are both romantic and religious? Or a romantic robot religion? OMG, i want this book so bad!! thats perhaps the funniest thing ive ever seen. A metal priesthood would solve many problems. The senior ones are given root privileges, and those under him have to cop it in the can. No questions asked.